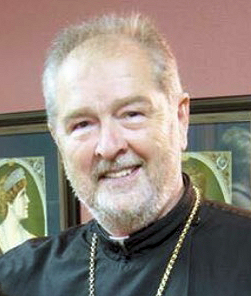 Father Dragan Filipovic, 73, of Pittsburgh, died unexpectedly Tuesday, September 18, 2018, in his home. He was born December 30, 1944, in Belgrade, Serbia, a son of Branko and Danica Milosavljevic Filipovic. He graduated Iona College in 1968, and St. Vladimir's Orthodox Theological Seminary in 1971. He was ordained to the Diaconate August of 1971 and to the Priesthood September of 1971. During his 47 years of priesthood, he faithfully served Orthodox parishes in Phoenix, Arizona; Denver, Colorado; Cumberland, Rhode Island; Pittsburgh, Pennsylvania; and North Canton, Ohio. Upon retirement, he served as second priest at All Saints Greek Orthodox Church, Canonsburg. Father Dragan served as the chaplain for the Stark County Sheriff's Department, in Ohio, and the Washington County Sheriff's Department, in Pennsylvania. In addition to his ministry, he was a dedicated husband and father. On June 14, 1970, he married Mirjana Zivanovic Filipovic, who survives. Also surviving are his son, Matthew Filipovic, and his wife Brittany, of Moon; his daughter, Elizabeth Fuellhart, and her husband Jack, of Mt. Lebanon; his sister, Jelena Djurovic, and her husband Blagota, of Montreal, Canada; his grandchildren, Aleksandra and Jacqueline Fuellhart; nieces, Natasha Duric, and Gordana Bozovic; nephew, Bosko Djurovic, and his wife Nancy; 4 great nieces, 3 great nephews; and many God children (Kumovi). In addition to his parents, he was preceded in death by his sisters, Dragana, and Spomenka Filipovic. May God grant him rest with the Saints, and may his memory be eternal. Friends will be received Sunday, 3-8pm, in the All Saints Greek Orthodox Church, 601 W. McMurray Road, Canonsburg, PA, 15317. Trisagion Sunday at 7pm. Reading of the 3rd hour will be held at 8:30am, Monday, in the church, followed by Divine Liturgy at 9am. Additional visitation will be held from 10-11am. Funeral services will be held Monday at 11am, with His Eminence Metropolitan Savas of Pittsburgh, and Father George L. Livanos, officiating. Burial services will be held at 4pm Monday, at the Holy Transfiguration Monastary of Elwood City. Arrangements entrusted to Sollon Funeral and Cremation Services, LTD, 30 East College Street, Canonsburg, Phillip L. Sollon, supervisor, J. David Sollon, director, 724-746-1000. Orthodox Church, 601 W. McMurray Rd. Canonsburg, PA, 15317.